RA Sushi Orlando is giving guests an all day Happy Hour, as part of a Tax Day promotion, so this offer is valid on April 15 only. 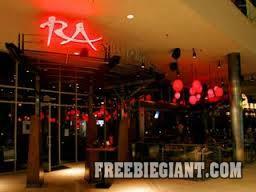 If you would like to take part in this offer, simply click here to find the nearest RA Sushi Orlando location. As part of this promotion, you will be able to get drinks and food for about half price, starting at $3.29. This offer is only valid on April 15 only, and is available all day long, until the restaurant closes.